I've been a big proponent of Goners, the supernatural adventure series from Image Comics, written by Jacob Semahn and illustrated by Jorge Corona. The heart-pounding story of the last of the Latimer family, world renowned and legendary defenders against the paranormal, are on the run from evil forces. 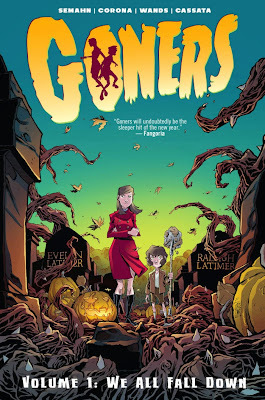 The first six issues were recently collected in a hit paperback volume, Goners Volume 1: We All Fall Down, and I was fortunate enough to interview the creators via email about their first arc and the future of the series. A writer's story idea is like a newborn, a raw, vulnerable extension of the author, and then you entrust a caretaker to illustrate your idea. How or when did you know that Jorge Corona was the right partner? And Jorge how well did Jacob express the vision in his head for what became Goners? JACOB SEMAHN: I met Jorge at the Man of Action booth at NYCC in 2013 and he showed me his portfolio and the moment I saw it, I instantly knew that his animated style would be the perfect look of innocence in a world gone mad. It elevated the book in a way that I didn’t expect. 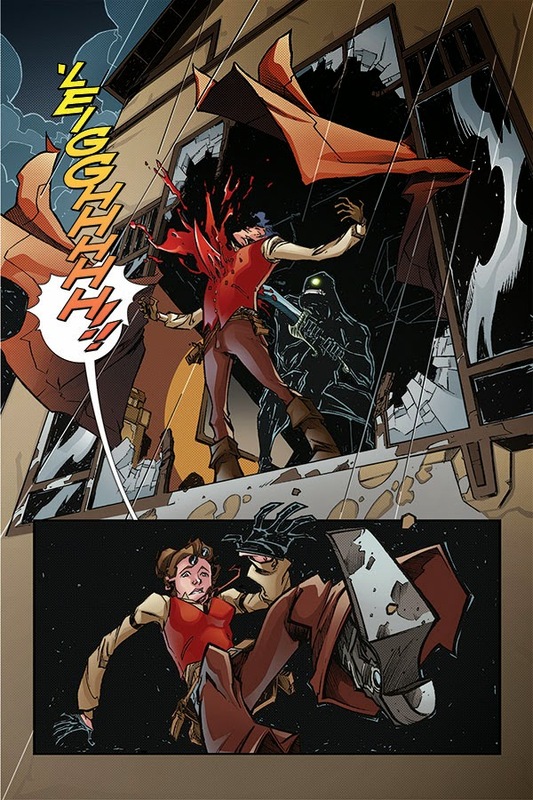 I think Jorge’s art is what sets the book apart from other horror endeavors out right now. JORGE CORONA: After we met at NYCC, Jake sent me an email about the project that was then called The Family Latimer. I immediately fell in love with the idea and once we started talking about it and my initial thoughts after reading it, we realized we were envisioning the book in the same way: this sort of Saturday morning cartoon taken to the next level. Working with Jake has been one of the best collaborative processes I’ve been lucky to be a part of. You've put the Latimers through so much and a lot of it was influenced by your love of horror, fantasy, and movies. Was there one major influence, above all, that you kept using as your muse? Jorge, what was your inspiration for the character designs including the monsters? JS: I probably would have to point to two big influences: Black & Dekker’s Monster Squad and Stephen King’s IT. Squad brought the fun and nostalgia to kids fighting monsters, while IT brought the horror of loss and what true stakes look like when having children face off against an ancient evil. It’s not always a happy ending. JC: Since the get-go, Jake and I talked about making the look of the book as timeless as possible. Out of that I tried to establish a certain Art-Deco and Victorian tone that would still feel current. It was that general idea that spawned the look and style of the characters. The monsters came from a variety of classic horror movies where the human form was still there underneath it all. One of the things about Goners that I really enjoyed was the relationship between Zoe and Josiah. They had been through such a traumatic experience with the death of their parents and so many obstacles along the way yet stayed together and protected one another. How important was it that the Latimer siblings expressed a strong bond amid the chaos? JS: It was the MOST important. It’s so easy to fall back into that sibling rivalry cliché, but I guess I’ve been lucky enough to be around friends who have amazing best-friend relationships with their siblings and it just seems like the best time. They’re always there for each other. And for some unknown reason that’s rarely been done in stories. I get that drama is more interesting to watch/read, but I found that the external horrors and drama were so elevated that there was absolutely no need to add some dark edge of rivalry to the mix. I think it would’ve weakened the story overall. Jorge, your work on Goners is some of the best in comics. 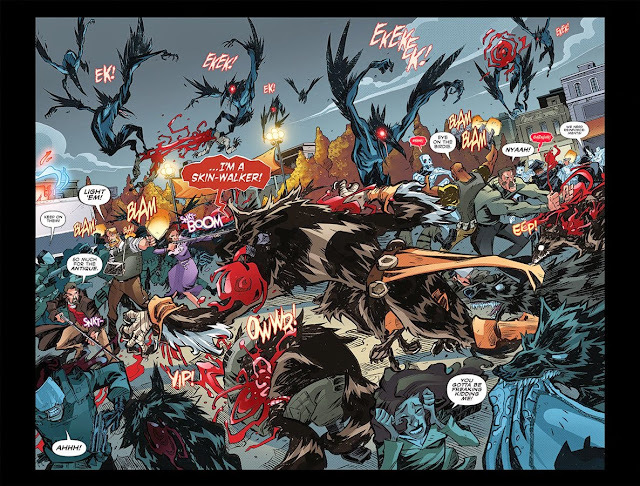 Everything from layouts to detailed architecture and expressive faces to monster designs was top notch. I especially liked when Francis and the kids jumped through the window as the cliffhanger of one of the issues and in another issue the street scene when Francis and the police went toe-to-toe with the monsters was also memorable. Was there anything Jacob had requested in a scene you couldn't do? JS: I have so many jokes right now. JC: Jacob Semahn is a fan of the word “dozen” and every time that word showed up in the script it was time to curse his name. But in the end all those memorable scenes came from Jake and his script pushing me to go bigger and do greater things within the page. But the real great thing is that Goners was as much collaboration as that word could mean. Jake and I often went back and forward thinking of better ideas to show the story we had in mind, it was that process that resulted in the book we now have and it was each of us bringing the best we could to complement each other. Jacob, you used flashbacks and the afterlife to great effect to draw on the lineage of the Latimers and help give the present some more background. You could go into the next arc with a prequel. How much more will we see of the Latimers of the past going forward? JS: Josiah has sub-consciously lived the life of George Latimer, The Immortal, so we will be seeing a lot of George’s past alongside the current mystery. One of the big themes that will present itself in every mystery of Goners is how the past will repeat itself. On the business side, Goners return is in question, which is very surprising. A book as good as Goners deserves to go on but what more could you guys as creators have done? Or anything more Image could have done to promote it? JS: No one has failed in promoting Goners per se. It’s more of a culture of pop culture. We’re competing with huge event books and new #1s. The market is heavily saturated week to week and a book by no-name guys will of course get lost in the shuffle. It’s our big first independently owned book and we kept looking to Kirkman’s Walking Dead #1 and repeating “That book only sold 5,700 copies.” Like a mantra. Things like this are found in TPBs. It’s unfortunate, but order numbers and sales are what drive these types of things, so if it doesn’t catch on, we’re sunk. Luckily our v01 numbers were quite healthy, so thanks to all of the shops and readers who ordered/bought it and checked us out. We really appreciate it. What can we expect from Goners when it returns? JS: Josiah and Zoe Latimer, having taken up the mantle, go on their first investigation… at a public school! Dun Dun DAAAAAAAA! JS: And I’m still asking for you to stop asking.